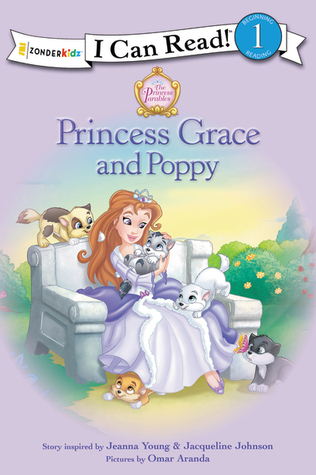 A YEAR OF JUBILEE REVIEWS: Princess Grace and Poppy I can Read! Princess Grace lives in the castle with her 4 sisters and Daddy the King. Grace finds 5 kittens under the stairwell and promises her father that she will care for them if he allows them to stay. Grace chose one kitten as her very favorite and named her Poppy. She adores this special little kitten. She notices one evening at dinner that Poppy is not with the other kittens, where could she have gone? Grace chooses to pray to God to protect Poppy and keep her safe, her father the King telling her that God hears her prayers. I love how she turns to God for help rather than feeling despair. The king and princesses all go out to look for Poppy in the woods, Grace continuing to lift prayers to God. Nearing giving up, Grace trips and falls in the woods and as she lands on the ground looks up and sees Poppy. God did help her find Poppy! I know my little one loves kittens, mix them with princesses in a castle and you have a perfect early readers for young girls! Filled with the knowledge that God cares for us and hears our prayers. It is nice to see the King and her sisters help Grace locate the missing cat. Even though they had 4 others, this one was still special as well.